Pt. 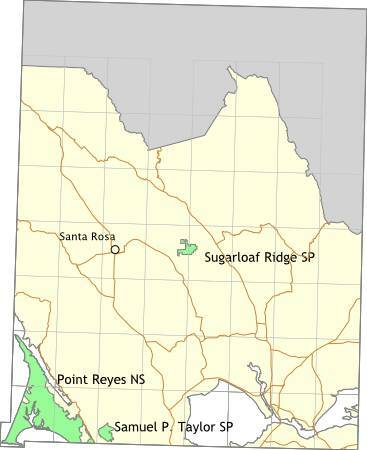 Reyes has over 60,000 acres of mostly untouched land, extending from the shore over some low hills. There are four campgrounds in the park - camping is allowed only in the campgrounds. Campers are limited to a total of four nights. Check in at the visitor center before departure - trails are often impassable and water at the campgrounds can be tainted. All campgrounds have water, fire grills (you know, a metal box on top of a three foot high pole), toilets, food lockers, and a hitching rail for you horse. Campground reservations are required, and can be made up to three months in advance. Get reservations early - this is a popular place. Just north of Pt. Reyes is a large private campground - Olema Ranch Campground - with water, toilets, and showers. Reservations accepted at (415) 663-8001. $16 and up per night. Point Reyes is located off highway 1, 40 or 50 miles north of the Golden Gate Bridge. The visitor center is near the town of Olema. 2,800 acres, all beautiful. The center of activities is a creek running through a redwood grove, but there are miles of trails, canyons to descend into, and hills to huff-n-puff up. The campsites look nice - car camping, no environmental sites - but I have never been able to get a reservation. Looks like you need to call well in advance (ie, six months may not be enough time). From Highway 101, take Sir Francis Drake Boulevard past the town of Lagunitas. Continue for a couple of miles and look for signs. Sugarloaf is far enough from the Bay Area to keep the crowds down. Visit during springtime to see the wildflowers in bloom, and the park generally green. Resembles a blast furnace in the summer. The park used to have primitive campsites, but I have heard they've been developed since I was last there. You can expect to find toilets and potable water available in the campground, plus tables and fire pits or stoves at each campsite. From Highway 101 near Santa Rosa, take Highway 12 eastward to Adobe Canyon Road. Follow Adobe Canyon Road northward to the park.